Really, feel free to nominate us as Best Blog in the Phoenix Best of Providence 2010 Poll. Feel free to tell your friends, and your mother, and your priest, and your dog to nominate us too. We won’t mind. I had already thrown you a nomination because I can no longer handle the inanity of The Daily Dose. That sounds doable. I hate the Phoenix “best of” section though. They promised free movie passes for filling in the survey last year…………and i’m still waiting. Well that is some BS. I definitely nominated you! Maybe there is some number of nominations threshold. 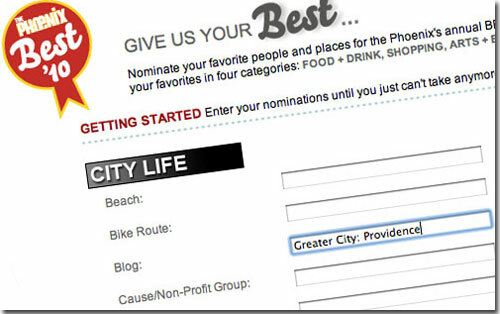 so, someone nominated GC;PVD but we didn’t get in, and yet the Phoenix’s blog did? Interesting. I smell a rat.